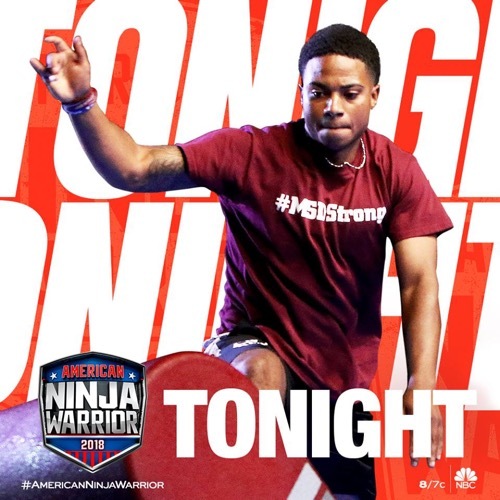 Tonight’s episode looks like it is going to be a great season 10 episode 1, so be sure to tune in for our coverage of NBC’s American Ninja Warrior at 8 PM – 10 PM ET! While you wait for our American Ninja Warrior recap make sure to check out all our American Ninja Warrior news, spoilers, recaps & more! Tonight’s American Ninja Warrior recap begins now – Refresh Page often to get the most current updates! Everyone was in Miami on tonight’s all new episode of “American Ninja Warrior” as the show continued with the Miami tryouts. The show was forever shaking things up and they did that again with rearranging the obstacle course. This time around the contestants faced the Floating Steps, the Fly Wheels, the Razor’s Edge, the Ring Turn, the Slippery Summit, and the two editions of the Warped Wall. Some of the obstacles were familiar to the crowd however the newer ones carried all the risks. The contestants usually practiced their full run at home and so these newer obstacles were things they didn’t even think to protect themselves against. Yet, regardless of this fear, there was nothing that could deter Bootie Cothran. He was the first ninja of the night and he wanted this year to be the year. Bootie always tried out and he always just missed the opportunity to press the buzzer. Only Bootie returned to the show with a much lighter frame. He came in weighing at 106 and was hairless. Bootie made sure to get rid of everything that could derail him and he hadn’t risked overall fitness to do it. He was still fit and his upper body strength was something to behold as he flew through the course to become the first person of the night to press the buzzer. It had been unprecedented run and it gave Bootie a great time to beat. The next person to official run the course was Jessica Clayton. She was a single mother to three children and was also a former Marine. She had been trying to get ahead with the show when a personal setback almost derailed her. She and her family were homeless for a while and she had wanted to quit ninja training. Now, the next ninja was Michael Johnson. He was coming in at 6’1 and those long arms came in good use. He had no problem with most of the obstacles and was doing well until the Slippery Summit. Michael was over two hundred pounds and it didn’t matter that it was mostly muscle. His body eventually dragged him down and fell into the water. His best chance if he makes through on timing and so he too has to wait and see. The ninja that followed Michael was Dan Courtenay. He was a forty something rookie and decided to join the show because of his daughter. His daughter Lucia was born with Down’s Syndrome and things have been hard for her since birth. It just never let that stop her and so Dan hadn’t wanted his age to be thing to stop him. Dan tried out for the for show for the last four years and he thought his luck had turned for the better when he made it this year. As it happens, Dan’s run hadn’t been all that great. He had wobbled from the very beginning and had gone on to wipe out on the second obstacle, the Fly Wheels. Dan had made his run for great reasons and it was unfortunate that he didn’t make it only the show had to move on. The next person to reach that buzzer had been Nick Patel. He was known as Nicky Thumbz and he first tried to reach the Mega Warped Wall. He didn’t make that one and so it was a good thing he met the shorter one. Then, after Nicky, there was the return of Morgan “Moose” Wright. The Moose had made a name for himself with his Moose hat and the whole falling right on his face (which still looked incredibly painful) though the man himself never seemed to let anything deter him. He was a PE teacher and had tackled the course like a teacher. Moose’s landings might not have been that graceful only he didn’t let that slow him and handled the Slipper Summit like no one has seen before. He went up the obstacle backwards and it actually worked to his benefit. Moose had no problem with dismounting and he wisely decided to go up the smaller of the Warped Walls because not a lot of people make it up that Mega one. So the Moose had been smart. There had been others after him that went after that Mega like Eddy Stewart for one and he missed it. Eddy was just lucky that he still had a chance to go after the smaller Warped Wall because making that one allowed him to be the fourth person to complete the run on tonight’s episode. The next person to take run at the course was Megan Dillard. She was a teacher and her teaching assistant was her dog Zeus. He was a trained therapy dog and he comes into class with Megan to help with her students. They make a very great team and Megan had even trained with her dog for the show. They worked out for hours and pretty much everyone could see the muscles on her arms. And so what should have been an easy run failed when Megan eventually tired out and fell on the Razor’s Edge. The nearby area of Parkland, Florida recently experienced horrific tragedy when a high school was targeted and many died as a result. But Gabe Stewart who was one of the heroes of the tragedy when he did his best to shield students had decided in the past few weeks to start training for ANW. He was new to the entire thing and was more or less relying on his past as a coach. He had large fanbase and everyone was showing MSD Strong. He wanted to show how much his school and community was healing and he did just that. Gabe didn’t think he would make it past the first obstacle and he made it to the Ring Turn. He hadn’t been able to grab the second ring because he had been a little too out of his reach and so he fell into the water. Except his friends and family all rushed to greet him at the pool. They hadn’t cared that he fell and had merely been proud of how far he had made it, so it really was a great showing of MSD Strong! Now the next ninja was quite familiar to everyone. Ryan Stratis tried out on the show before there were the crowds or the international attention. He was one of the original ninjas and nowadays he was a Ninja coach. It had seemed like he was going to stay being coach until his sudden return this season and naturally he didn’t disappoint. Ryan raced through the course and sure he wobbled on the Slippery Summit. It just didn’t stop him from making it to the Warped Wall where he then became the first person of the night to conquer the Mega Warped Wall. Not many veterans made it past the Slippery Summit! There had been the Mermaid Ninja Charity LeBlanc and she had created quite a following as a mermaid. She took that as her symbol since she loves the water and believed the creatures to be both beautiful and strong however she didn’t make it to the Warped Wall and neither did anyone else for quite some time. People just kept falling! It didn’t matter what they tried or how sure they were. They all fell until Brett Simms. He was a veteran of the show and had an ongoing bet with Ryan that whoever didn’t make it had to shave off their beard. The fact he went on to press the buzzer meant that both beards were safe for a little while longer. The next ninja to go up was the Cheerleading Ninja Lindsay Eskildsen. She debuted last season and proved to be quite a competitor. This time around, she did her best to move a little faster and was making great time when she went up against the dreaded Slippery Summit. Lindsay was barely on when she fell and so her it was her timing alone that was sending her to the City Finals. The ninja that followed was JJ Woods. He was a veteran on the show and this time around his niece Zoe got to be in the audience. She was too sick before to be there and so he was glad she got to be there this year. JJ unfortunately fell on the Razor’s Edge and so he’ll have to wait to see if he makes into the City Finals. And so it was great that his niece made it this time because her running into his arms was probably the highlight of his night. There were two more ninjas that made it up the Warped Wall during the commercial breaks. They were Kenny Niemitalo and Neil “Crazy” Craver. The veterans were later followed by the likes of Drew Drechsel who despite missing out on the Mega Warped Wall had gone on to complete the course with the fastest time. The final ninja of the night was the woman that broke all the records. Jessie Graff had was one of the few women to ever hit a buzzer and the fact she missed out on doing so last year meant she came back wanting to do just that. She raced through the course and there could have been several times in which she fell except she managed to surprise everyone by holding on. She became the first woman to make it past the Slippery Summit and she eventually became the first woman to hit a buzzer this season. And so what does she want to accomplish next, she says hit a buzzer during City Finals!